Pixel Qi is an exhibitor at CES this year, and I was finally able to see their screen first hand. (I've been wanting to see it for a couple years now.) They didn't have a booth; instead they rented one of the small meeting rooms in the far end of South Hall. It was incredibly crowded. If you're wondering why there are no extensive galleries of photos showing their screen tech, that's the reason. So this was the first time I've seen it, and I was surprised. Their screen looks like an LCD screen. That might sound funny, but I couldn't tell the difference between a Pixel Qi and a normal LCD. In fact, I've used LCD screens that looked worse than Pixel Qi. So basically this means that if you got one of these screens you'll get the benefit of a low power screen without losing any of the benefits of traditional LCD. I could seriously see this replacing most LCD screens at some point in the future. And there's one piece of gossip I can share. I was talking with one of the Pixel Qi people about the perils of rushing a screen into production. If you're wondering why they're taking forever to get their screens on the market, there's a reason. This is new technology and it takes time to get all the bugs out. Sipix came up, of course, as an example of why you shouldn't rush. So here's the gossip. He's heard that Sipix will be winding down production of the screens. I don't know if this is true but given the problems of the current generation Sipix screen I think it's a good idea. I love the early gen Pixel Qi screen in my OLPC XO-1. I can’t wait to see it in more products. Hmmmm…. what will that mean for Bookeen and their new Orizon? They use SiPix. So does one eBook device down in South America (Brazil?). Oh, wait! 9.7″ screen? If you can grab their attention again, ask them if they plan to make that iPad-compatible, so haXXorz can swap out that IPS screen for it. Might even be their best cash-out strategy to sell out to Apple. They certainly have the money to best exploit the tech. Even if they *don’t* get Apple onboard, the possibility might get other tablet vendors onboard. 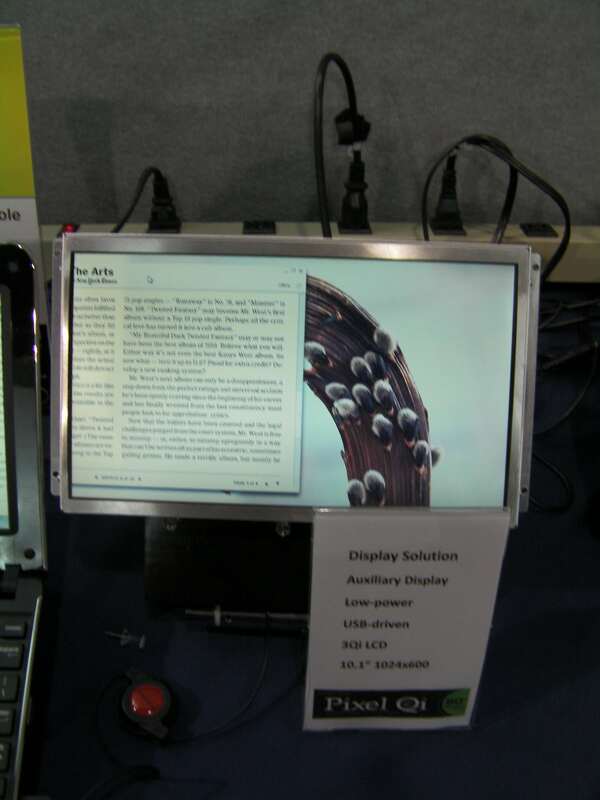 Fujitsu has long sold outdoor readable tablets for vertical markets. They might want to sign up. Apple likes the color-popping IPS screen. Until PQ screens pop colors like that, Apple won’t be interested. How does the reflective performance compare to e-ink Pearl? As far as I understood it *IS* an LCD screen, but with some additional layers. These make it possible to function as a reflective screen. So it shouldn’t be surprising that it is as good as LCD.